In the six years I’ve lived in Madison it seems like a new restaurant has opened every year . Some have been better than others, and some closed before I got a chance to try them out. The good thing is most of the new options have been opening up on the west side so they’re easy for me to get to. 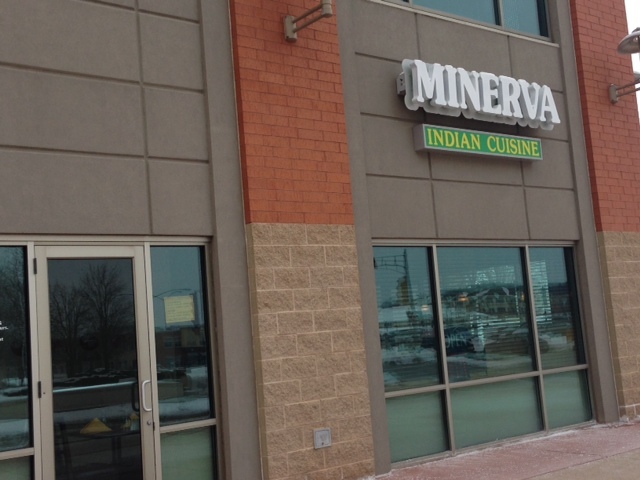 The newest addition to the Indian buffet lineup is Minerva on Junction Road. Minerva opened in a spot that has been empty in a strip mall for quite a while. The space is very tiny with a pieced-together buffet in the corner and only about a dozen tables. I don’t claim to be an Indian food expert, but I do enjoy a good buffet once in a while. I like it when the buffet offers a couple traditional options alongside the regulars: chicken tikka masala and dal. My favorite dish is malai kofta, but the day we went they didn’t have that on the buffet. Everything I got had a good flavor and was steamy hot (it bothers me when buffet food is luke warm). The fry fish was moist and not too fishy. The chicken tikka masala had a good curry flavor, and the chicken was tender. The paneer masala had a very similar sauce to the chicken tikka masala, and the paneer had a good texture (no one likes mushy paneer!). I’m not generally a fan of chats except for the onion flavor. Minerva’s onion chat was surprisingly good. It looked like the traditional onion chat, but it had a nice spice balanced by a tangy pickle flavor. The one thing that disappointed me was on my second trip up to the buffet there wasn’t any chicken tikka masala. The most surprising thing I got was a little deep-fried lentil and veggie ball. I wish I had written the name of it down so I could order it again. It was crispy and hot, and was perfect for dipping in the tikka masala sauce. Most buffets I’ve been to give you a basket of naan, but at Minerva they give you a dosa…I think it was a veggie dosa. A dosa is a super light and airy pancake made with lentil flour, and it usually has a little filing on the inside. Minerva’s dosa was clearly made in advance, and the filing was mostly flavorless. I would have preferred naan, so I didn’t have to find room for it on my plate up at the buffet. 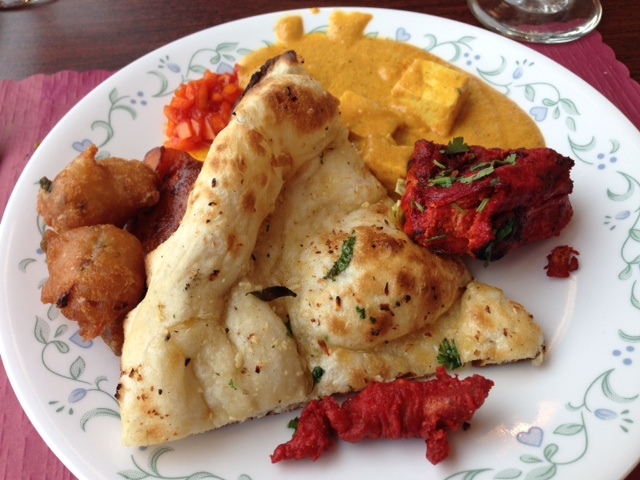 The garlic naan on the buffet was great…not too much garlic or cilantro. FOOD NOTES: I’m always up for a good Indian food buffet, so I’m super happy Minerva opened up on my normal errand-running route. The service was a little awkward, but mostly attentive. 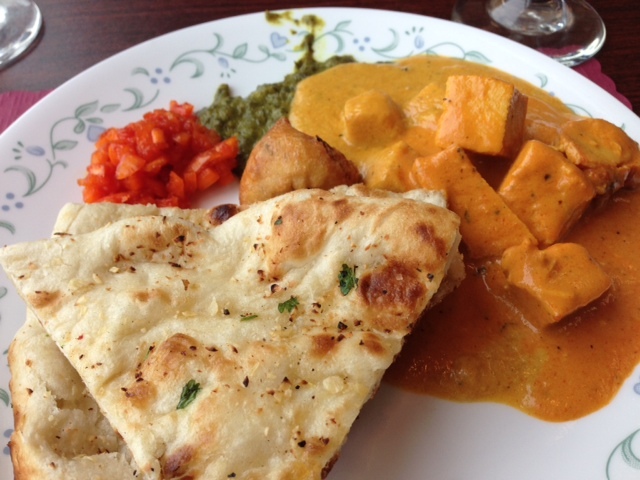 The $10 price tag is on par for an Indian buffet, and the amount of options was standard. I wouldn’t say there’s anything spectacular about Minerva’s food or buffet options, but it is good, solid Indian food in a good location. I hope they have malai kofta on the buffet next time I go.